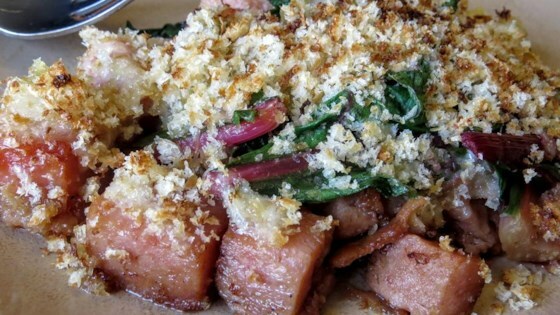 "SPAM® Classic or other variety and Swiss chard are cooked in a skillet, topped with Swiss cheese and breadcrumbs, and broiled for a quick and easy, one-dish, weekday meal." Heat olive oil in an oven-proof 12-inch skillet over medium heat; stir in SPAM(R) Classic and cook, stirring occasionally, until browned, 6 to 8 minutes. Stir garlic into skillet; cook until fragrant, 1 to 2 minutes more. Stir Swiss chard into skillet; cook until wilted, 5 to 10 minutes. Tear bread into chunks; process in food processor until the size of breadcrumbs. Top Swiss chard mixture with shredded Swiss cheese, then top with breadcrumbs; drizzle olive oil over the top. Place skillet under broiler until breadcrumbs start to brown, about 2 minutes. Scallops baked in a creamy sauce. If an oven-proof skillet isn't available, layer the cooked ingredients in a broiler-safe dish: first the SPAM® Classic and garlic, then cooked chard, then cheese, followed by breadcrumbs, and drizzle with olive oil. Broil as directed. One cup of pre-made breadcrumbs can be used instead of using bread. Two pounds of fresh spinach can be substituted for the Swiss chard, if desired. Drain the pan after wilting the spinach so there will not be extra liquid in the finished dish.